A little DIY (Do It Yourself) press this Sunday in the Pacific Magazine of the Seattle Times. How lovely to see the tree in newspaper boxes all over Seattle. I wrote this piece using photographs from my time at the Harvard Forest and recounted my time climbing the tree. Was lovely to relive it all over again! Thanks to Bellamy Pailthorp at Seattle’s public radio KNKX for this terrific radio interview, recorded under one of Seattle’s most glorious red oaks…we call this tree The Queen for every good reason. And thanks to Joel Connelly for this great review in the Seattle Post-Intelligencer. 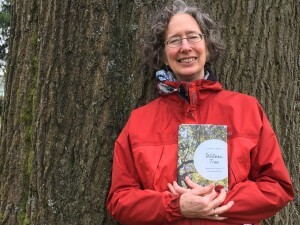 Looking forward to the book launch tonight at the Seattle Public Library, and headed east soon for the celebrations at the Harvard Forest 7 pm May 2 and Arnold Arboretum at 6 pm May 5. Hope to see you there! It’s publication day for Witness Tree. Celebrating with The Queen, a massive red oak at Seattle’s Volunteer Park. Talking about Witness Tree on Q13 Fox today.